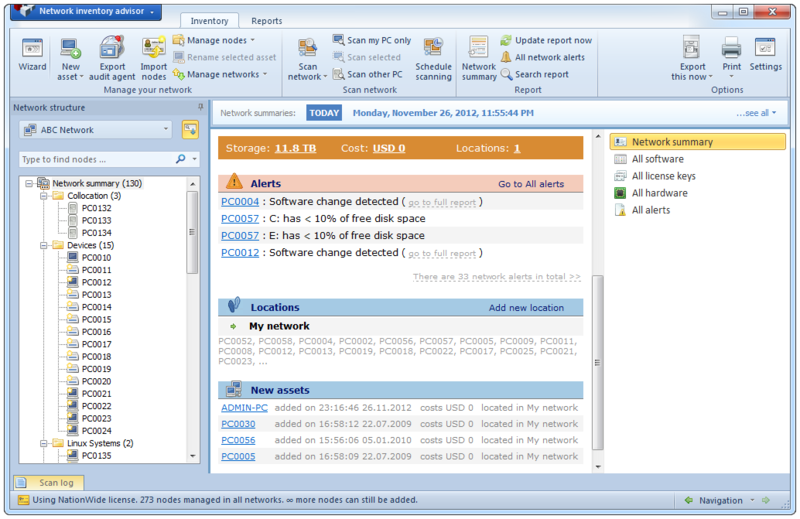 Network Inventory Advisor - Network Inventory Advisor is an agent-free solution for PC network inventory. It excellently performs remote agentless scanning of Windows, Mac OS X and Linux and builds custom inventory reports. With Network Inventory Advisor it\'s possible to group inventoried software titles by publisher, version, software type, etc. You can also specify software usage status (allowed, prohibited, must-have, etc), add notes to any software title (for reminding, licensing or other purposes), sort and filter them by multiple parameters, and build flexible report. software changes tracking. This means that whenever there\'s a software change on a node, you get automatically notified with the special alert. Nsasoft Hardware Software Inventory is a cost effective and powerful network inventory software for home, office and enterprise networks. The software scans all computers on a network and generates complete reports about computers hardware and software on remote machines. This information is added to the centralized database and then users can generate reports about each or all of the PCs on a network. Build an inventory of your entire network without leaving a chair! Total Network Inventory will scan your entire network, query all servers, workstations and appliances discovered, and record important information about every piece of hardware found. A perfect, effortless, hassle-free inventory. When trying to check a PCs hardware specification sometimes the only reliable means is to open up the box and see for yourself what\'s inside the system case. Clearly this is time consuming and when you have a huge number of PCs on your network this can be impractical. SyvirBuild 2 comes with an automatic network scanner that detects all off your Windows PCs in your local area network. When trying to check a PCs hardware specification sometimes the only reliable means is to open up the box and see for yourself what\'s inside the system case. Clearly this is time consuming and when you have a huge number of PCs on your network this can be impractical. SyvirBuild comes with an automatic network scanner that detects all off your Windows PCs in your local area network.